Here is a timetable of the history of Redemption Rock, including all important events from the time of Mary Rowlandson's captivity up to the present. 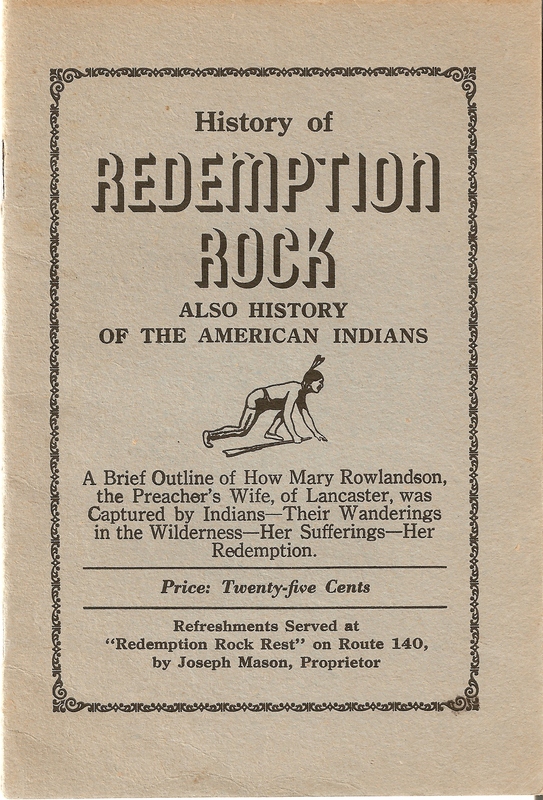 The story of Redemption Rock dwells deep within New England history. This Granite rock, measuring 35’ x 50’ x 75’, is the location of the release of Mrs. Mary Rowlandson to Mr. John Hoar, after eleven weeks of captivity by Indians. To learn more about the Captivity of Mary Rowlandson, and King Philip’s War, see the following pages. · May 2, 1676 – Mary Rowlandson is ransomed to John Hoar for a sum of 20 pounds, at Redemption Rock. · During the eighteenth century, the Everett family owned the land surrounding Redemption Rock. As legend goes, Mr. and Mrs. Everett were buried in a tomb just behind Redemption Rock. There they lay for 75 years before being moved to the Princeton North Cemetery. To this day hikers and tourists can still visit the Everett tomb. · 1930 – The Massachusetts Bay Colony Tercentenary Commission erected a sign on route 140, marking the location of Redemption Rock. · 1953 – Descendants of George Hoar donated the one-quarter acre of land, on which the rock is situated, to the Trustees of Reservations. · For over twenty years, Thomas Prince School has held a fourth grade field trip, to explore the history of Princeton. One of the main stops on this tour is to Redemption Rock, where the children are told the story of Mary Rowlandson. In addition to being a historical site, Redemption Rock is also a passing point along the Mid- State trail, which stretches 92 miles across Massachusetts. For more information on hiking see the “links” page.